Common Hawaiian-sounding Words … But Are They Hawaiian? Are These ‘Traditional’ or New Words and meanings to the lexicon in Hawaiʻi? While we use them in common language, and most often think of them as traditional Hawaiian words, it seems some words are relatively new to the islands and not part of the traditional Hawaiian language. Let’s take a look. To many, the lūʻau is the quintessential experience and expression of Hawaiian dining and hospitality. The reality is, it’s a relatively new word. 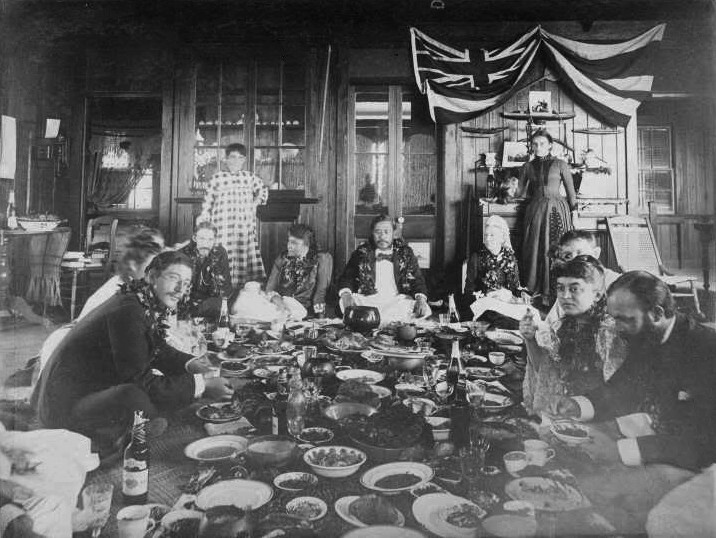 Traditionally, the ʻahaʻaina or pāʻina were the calls to feast and party together. These feasts marked special occasions — such as reaching a significant life milestone, victory at war, the launching of a new canoe or a great endeavor. They believed in celebrating these occasions with their friends and families. It was a sad day when Arakawas in Waipahu (operating from 1909 to 1995) closed its doors. Gone was the assortment of colors and sizes of palaka wear (the shirts were originally only blue and white,) as well as the myriad needs filled by the diversity and depth of the merchandise in the store. Arakawas headed the growth of the palaka shirt. The Hawaiian term for food is ʻai. Kaukau in this context is not an Hawaiian word. Hawaiian dictionaries note ‘kaukau’ meant a heap of stones in a field used as a temporary altar on which the fruit of the field is laid as an act of worship or a snare to catch birds. OK, this one is not as clear; the word is used in the Hawaiian language as “A coming together of two or more things; a uniting; an assembly. (In the Maori language, hui, means, come together. )” Today, in Hawaiʻi, a ‘hui’ is a partnership or association of folks cooperating in a common cause. Hui is also a Chinese word, generally meaning ‘conference’, but which is sometimes used to refer to a secret society. The ‘Hui’ had special meaning in November 1894 when Sun Yat-sen, on his third trip in Hawaiʻi, established the Hsing Chung Hui (Revive China Society,) his first revolutionary society. On another visit to Hawaiʻi (in 1903,) Sun reorganized the Hsing Chung Hui into Chung Hua Ke Min Jun (The Chinese Revolutionary Army) in Hilo. In 1905, in Tokyo, Sun reorganized the Hsing Chung Hui and other organizations into a political party called the Tung Meng Hui. Likewise, the Chinese Revolutionary Army was reorganized and all of its members Tung Meng Hui members. Back to food; lomi lomi salmon … but Hawaiʻi’s waters don’t teem with salmon; so, how did this become a lūʻau staple and into a compartment of our lūʻau plates? 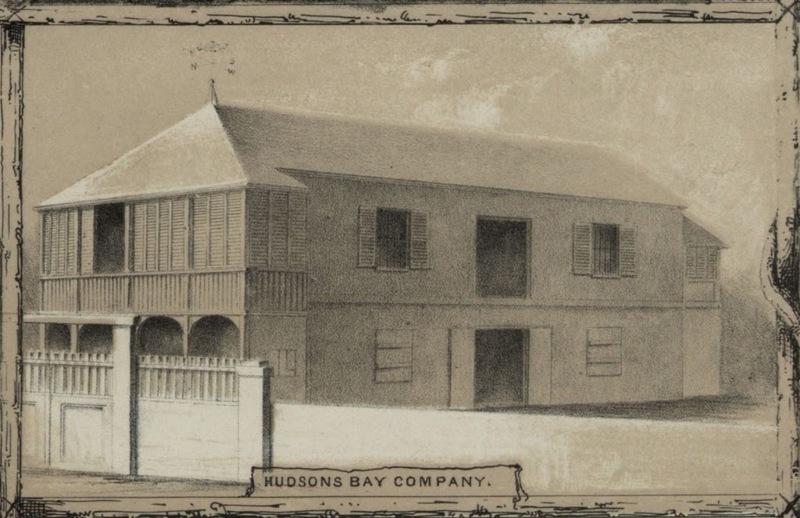 Hudson’s Bay Company (HBC) had its regional headquarters was in the Pacific Northwest in the mid-1800s. Salmon was a mainstay of life of the Northwest Coast Indians. Fresh or preserved salmon, in turn, became a staple food for HBC posts west of the Rocky Mountains. By 1830, the HBC was preserving salmon on the Columbia River and at Fort Langley on the Fraser River as well, mainly to feed Company personnel, but with some 200 to 300 barrels of Columbia River salmon exported that year, presumably all to Hawai’i. Preserved salmon found a ready market on O’ahu, particularly among native Hawaiians. Just when that notable dish, lomi lomi salmon, first made its appearance is unknown, but if it was in fashion by the 1830s, the HBC can take credit for being the main provider of its principal ingredient. During the 1830s, HBC sold several hundred barrels of salmon a year in Honolulu. The 1840s saw a major increase in sales; the peak year was in 1849, with 2,610 barrels exported to Honolulu. Lomi Lomi salmon, not a traditional Hawaiian dish (however, Hawaiian salt was used in preserving the salmon destined for Hawaiian consumption.) The source of the salt shipped by HBC to the Northwest Coast could have come from the Moanalua salt lake on Oʻahu, whose salt was considered the best for salting provisions and as a table salt in Honolulu. In ancient Hawaiʻi, men and woman ate their meals apart. Commoners and women of all ranks were also forbidden by the ancient tradition to eat certain foods. This changed in 1819, when King Kamehameha is best remembered for the ‘Ai Noa, the breaking of the ancient kapu (tabu) system of religious laws, six months into his reign, when he sat down with Kaʻahumanu and his mother Keōpūolani and ate a meal together. 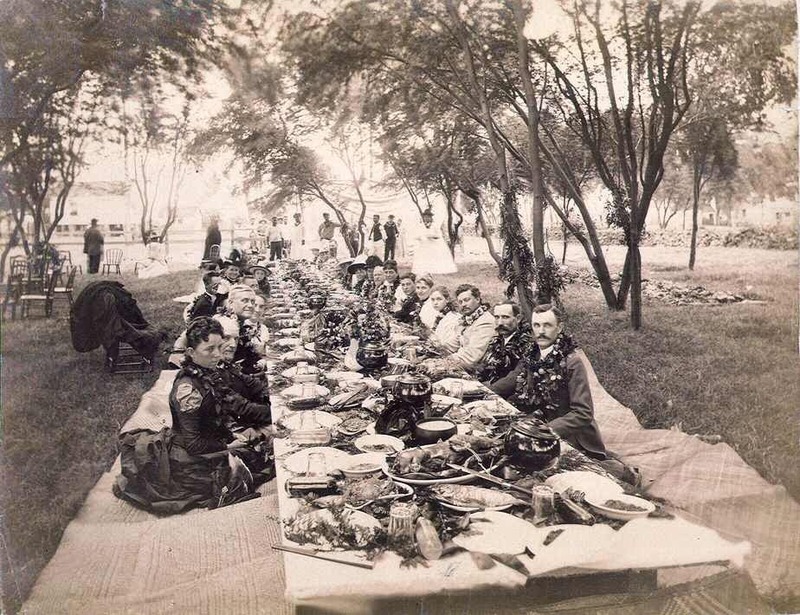 Up to about 160-years ago, the ʻahaʻaina or pāʻina were the calls to feast and party together. These feasts marked special occasions — such as reaching a significant life milestone, victory at war, the launching of a new canoe or a great endeavor. They believed in celebrating these occasions with their friends and families. Later, a new term was used – Lūʻau – to refer to these festive events; however, it’s not clear when. It’s interesting how a word that is associated as one of the most Hawaiian of activities (a feast,) is actually a relatively new term. The name came from the name of the young tender kalo (taro) leaves. It’s also not clear if this is the first reference to “lūʻau;” but it predates what Pukui notes as the first use of the term ‘luau,’ where she says it goes back at least to 1856, when it was used in the Pacific Commercial Advertiser. Some have suggested “luau” was used to describe the anniversary celebration party for the Ka La Ho‘iho‘i Ea – Sovereignty Restoration Day Kauikeaouli (Kamehameha III) had in 1847 – with 10,000 guests. While no newspaper accounts have been found describing it, the minutes of the Privy Council note that they “voted that the King make a large feast at Luakaha on the 31st day,” in their July 1, 1847 meeting. The use of the name grew. While it’s not clear when the reference was first made, today, people still get together with family and friends at a lūʻau to celebrate special events. Of course, in addition to the lei and entertainment (formal and informal,) now, you can also expect lots of the “typical” lūʻau food including kālua pig, poi, sweet potatoes, rice, lomilomi salmon (also a relative newcomer) and much more. The image shows Stevenson, Liliʻuokalani and Kalākaua at a lūʻau in Waikīkī; in addition, I have added other images in a folder of like name in the Photos section on my Facebook and Google+ pages.